Citrus juice really tastes tantalizing and appetizing and it is also packed with nutrients and available readily for purchase in the market. If you are health conscious who want a processed-free diet, the juices cannot fulfill your needs. In the supermarket, all the juices have added ingredients to stay fresher and longer. Some added ingredients can remove nutrients off the juice and even affect taste. If you have your own citrus juicer, you can create the fresh fruit juices from your kitchen, whenever you need a cup. Even the best food processors are failed in terms of juicing. A juicer and food processor are not the same. There are lots of citrus juicer models out there to make juice. You can find both manual and electric models offering their own pros and functions to stand out. You can enjoy delicious juice whenever you need and even more. But it doesn’t mean you should buy the first juicer you get, by just assuming that they are made the same. Citrus juicers are different and some are even better than others. It is on you to choose the right citrus juicer that is most suited to your kitchen. After proper research, we have found the top 10 citrus juicers for you with some handy features, quality juice extraction and best pricing. Check my list for the best cold press juicer also. 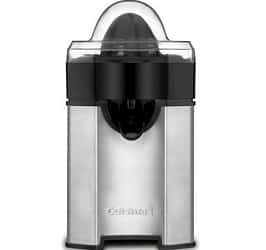 Cuisinart CCJ-500 Pulp Control Citrus Juicer is made of sleek brushed stainless steel to extract more juice from the smallest lime to the largest grapefruit efficiently. 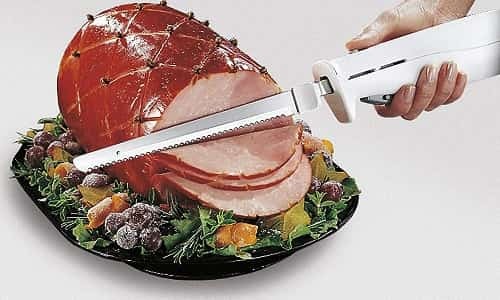 It has auto-reversing adjustable reamer with more pulp control settings for your family needs. It has unique final spin feature to maximize juice from each fruit. 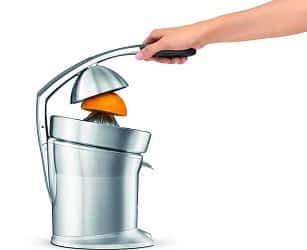 Breville 800CPXL die-cast stainless steel citrus press is fully functional and well designed. It has revolutionary active-arm mechanism with in-built sensors to keep track on arm position and activate the spinning cone safely as it gets in touch with fruit. The spherical fruit dome of the unit centers fruit well on spinning cone and two filters made of stainless steel enable variable pulp control according to your own preferences. It gleams well with brushed die-cast stainless steel housing as well as motor body. This item can add grace to any kitchen countertop. Along with it, die-cast juicing cone offers four well-positioned multi-tiered finds. It efficiently and effortlessly juices any citrus fruit with Quadra-Fin technology from smallest lime to largest grapefruit without having to change cones. Want to make quick on-the-go lunch? Are you fed up of having heavy foods? You always need a well-made juice which is a great diet choice for delicious and instant meal. But it is not always easy to get the right juice. This is where you need Gourmia Large Citrus juicer. It is the best device to get the most of your fruits to have delicious and healthy beverage. It is ideal for anyone as it provides one-motion system. Slice your grapefruit or orange in half, put it in strainer and press down the handle to squeeze out the juice. Extract every last drop from fruits you love and get healthy and tangy beverage at home. Do you want to make fresh citrus juice without stress of squeezing by hand? 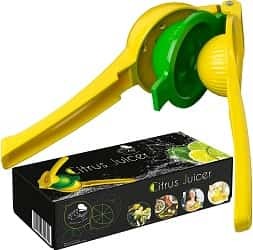 The manual citrus juicer from Chuzy Chef is 2-in-1 lime and lemon squeezer which won’t wear out your hands or take a long time simply to produce a couple of drops. This handheld press effectively and instantly juices different lemons and limes and even smaller oranges. It is a reliable and handy citrus juicer which has a couple of strong aluminum bowls which can squeeze off every drop of your favorite fruits. It has certified, non-toxic lead-free coating for great durability. 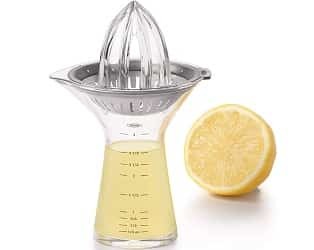 Lu Cucina Citrus Strainer and Juicer is a handy tool to get the most of your favorite citrus juice. It is efficient, strong, easy to clean up and use. 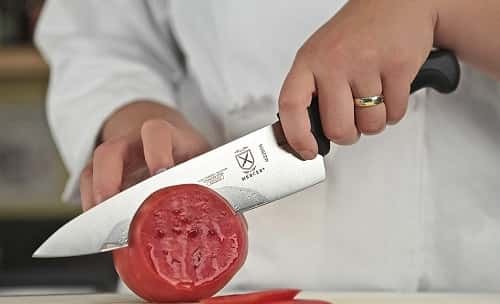 It is made of food-grade, durable stainless steel which has been designed sturdy and strong to last. The best part is that the juice falls directly onto the food, rather than squirting on the sides. Even the tiniest bits of pith and seeds are trapped in its bowl. Bring your home Dash Citrus Juicer Extractor to start your days with a glass of your fresh and favorite squeezed citrus fruit. Be it grapefruits or orange, limes to lemons, this juicer extractor lets you to squeeze out the freshness off any citrus fruit of any size. Enjoy the sweet hint of freshly squeezed juice without preservatives, additives or stress with Dash electric citrus extractor. It has automatic on/off feature to make juicing effortless. All you need to press the fruit down and release to stop. You can choose from different colors of this juicer. If you love to enjoy homegrown grapefruit or orange juice at home every morning or love the bright taste from freshly squeezed lemon as well as lime juices to your cooking so you can get the job done. Unite the typical hand press design with motorized reamer to take all the stress away from juicing. Whether recipe needs a teaspoon of juice or OJ for 20, this lightweight machine with rubber grip does all the hard work for you. In addition, it helps control juicing process. You can decide when squeezing is performed to avoid bitterness on juicing. 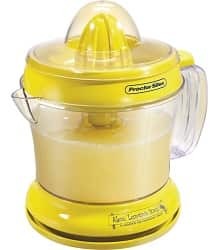 The Alex’s Lemonade Stand Citrus Juicer from Proctor Silex avoids the stress of juicing manually so you can get the most of fresh lemons, oranges, limes and grapefruits. You can have one in your kitchen for quick lemonade glass or for adding citrus hint to your homemade dressings, sauces, and marinades. This small citrus juicer can cater to all your juicing needs. It has reamer for efficient juicing with in-built strainer catches pulp and seeds. 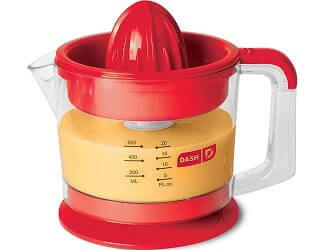 It has compact container with measurement markings and spout to pour juices without drip. HIC Glass Citrus Juicer juices fresh lemons, oranges, grapefruits, limes, and other citrus fruits. 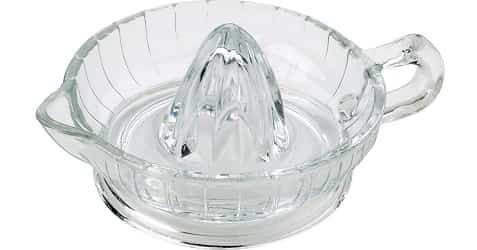 Enjoy the delightful taste of fresh citrus fruits in seconds. 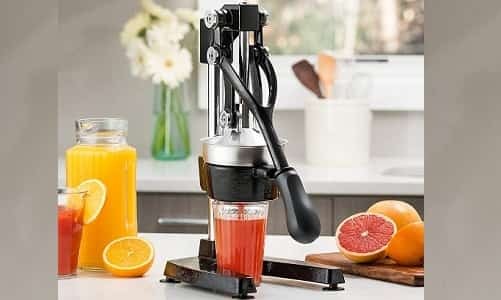 This classic manual juicer is ideal for making fresh squeezed orange juice to make healthy smoothie recipes and fruits, mixed fruit juices, and more. Do you know that a juice extractor and a citrus juicer are two entirely different products? If not, then you should know that both of the products are entirely different. A juice extractor extracts the juice from fruits or vegetables with ease, in a juice extractor, the entire fruit or vegetable goes inside the machine. On the other hand, a citrus juicer comes with a rotating cone shaped head that rotates and the user will have to press the citrus fruit on the head. With the demand for citrus juicer increased, the brands that market citrus juicer has increased. Here is a buying guide that would help you get the best appropriate citrus juicer from the market today. Type of citrus juicer – Most of the people assume that there is only one type of citrus juice available on the market. No, there is more than one citrus juicer available on the market. Pulp control – As the name suggests, the pulp control citrus juicer is specially designed to control the amount of pulp that mixes with the juice. Spin function – This type of juicer is the most expensive of all, it is designed in such a way that it could extract the maximum pulp from any citrus fruit. 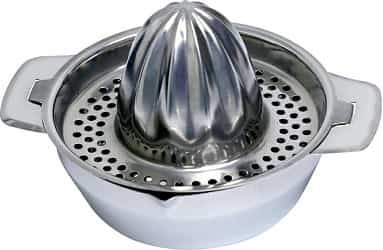 Reverse reamer type – This type of citrus juicer is the most commonly used, it is designed in such a way that it could extract the maximum from the fruits. 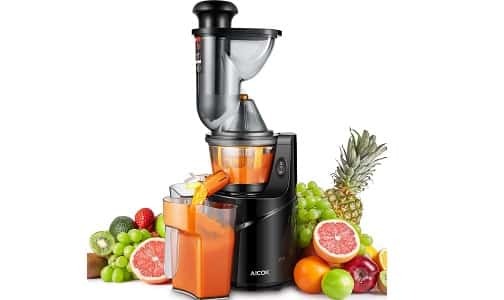 However, the pulp and seeds are left behind, which means the rich fibers in the fruit is also lost if the juice is extracted using this type of juicer. Size of the reamer – You know that citrus juicer comes with reamers and it is one of the important parts of a citrus juicer. There are citrus juicers on the market that comes with different reamer sizes. However, a citrus juicer with a single sized reamer will not be efficient to extract juicer from all the fruits, for example, will not be efficient to extract juice from lemon and orange at the same time. So we recommend that you consider the citrus juicer based on the fruit size. Multiple reamers or not – Most people prefer using a citrus juicer with a single reamer or utmost dual reamers. However, the efficiency of single or dual reamer citrus juicer is limited, whereas, if the juicer has multiple reamers then the user could extract juice from more number of citrus fruit, therefore, making the entire process easy and quick. But one of the greatest causes of concern is that as the number of reamers increase the size of the juicer also increases. 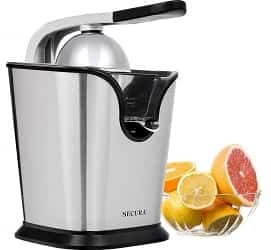 So, if you do not have much space to spare to keep the citrus juicer, then, avoid such type of citrus juicer. Ease of cleaning – When compared to juice extractor or normal juicer, the citrus juicer is easy to clean as it comes with the lowest number of parts. However, few citrus juicers come with complicated parts. We would recommend that before you purchase the citrus juicer check if the juicer is dishwasher safe and designed in such a way that it is easy to clean manually. Trust me, let the product come from any top brand, if it is not easy to clean, then you will surely regret purchasing it. Quality of the juicer – Quality of the citrus juicer just does not only mean the durability of the juicer but if the material used to make the juicer is food grade and if it is certified not to add chemicals to the food. So check the specification and make sure that your product is BPA free. Cleaning the citrus juicer is very important to keep the juicer healthy. Here is how to clean the citrus juicer. Step 2: The citrus juicer will have removable parts, remove all the parts carefully. Step 3: The citrus juicer will have a filter, clean this filter by pouring water and then keep the filter away. Step 4: Now, clean each part separately using warm water and use a soft scrubber if you find the deposit hard to remove. Step 5: Once, you have done cleaning, wipe dry the entire parts and then assemble the product. The above mentioned facts and details will help you get the best citrus juicer on the market; follow the cleaning instructions to keep your juice clean and healthy. With citrus juicers, you can rest assured of minimal toxicity, good health and no side effects. All of these juicers are made for safety, quickness, user-friendliness, safety, and hygiene. These citrus juicers can help making quality juices at home.